One driver in rural Georgia found himself in a hole heap of trouble while on his way to work. 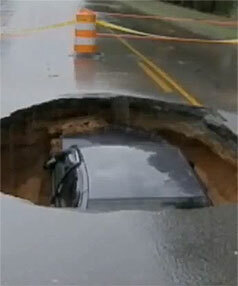 Ira Strong was headed to work Saturday morning when his car was suddenly swallowed up by a giant sinkhole in the road. “After I hit the hole, my airbags deployed and I came to my senses and looked around and realised I was still alive. I just climbed up out of the hole and called for help,” . The sinkhole, caused by heavy rain in the area, had been marked by police beforehand but during the night someone had moved the traffic cones around the road hazard. This entry was posted in Pictures, Vehicle v Sinkhole and tagged Georgia, sinkhole, sinkhole v car. Bookmark the permalink.